STURBRIDGE, Mass. (Feb. 9, 2011) – This March, visitors to Old Sturbridge Village will be greeted by the sweet smell of wood smoke mixed with maple syrup as historians demonstrate maple-sugar making at the Village’s own working “Sugar Camp.” Each weekend in March from 10:00 a.m. – 2:00 p.m. visitors can see the sugar-making process, from tapping the trees to “sugaring off,” and will learn why maple sugar was more commonly used than maple syrup in early New England. 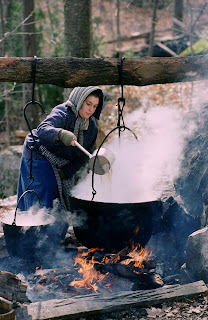 Interpreters will also cook period foods made with maple sugar by agricultural the hearth at the Village’s Freeman Farm and historians will discuss how maple sugar became a part of the abolitionist movement. OSV will also present the importance of maple in the Native American culture. 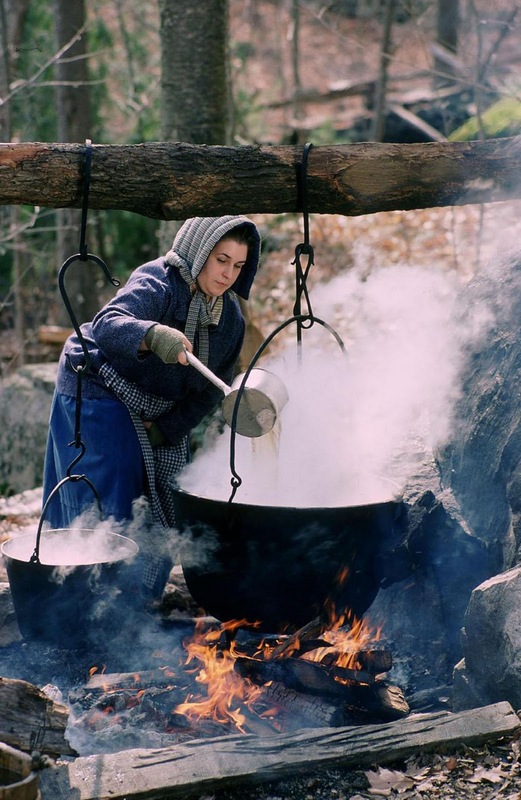 Production of maple syrup is one of only a few processes in North America that is not a European colonial import – it was developed by Native Americans and taught to the colonists. The Indian Doctress Molly Geet, portrayed by Marge Bruchac, will present “Sogalikiosos: Maple Sugar Moon Stories,” and “Fur Mittens and Wooden Snowshoes: Algonkian Winter Fashions.” For details: 1-800-SEE-1830, www.osv.org. Though the sap from sugar maples has the highest sugar content, red maples are more abundant in this area, and both will be included in the Village’s “sugar bush.” Maples are usually tapped beginning between 30 and 40 years of age and can continue to be tapped for sap until they are over 100 years old. The sap will continue to flow as long as temperatures remain below freezing at night and above freezing during the day. As the spring progresses, even if the temperatures cooperate, tapping is generally stopped once buds begin to form on the trees as their presence causes an unpalatable taste in the sap. The climate of New England, New York, and southeast Canada are ideal for producing maple syrup and maple sugar – 80 percent of the world’s supply of maple sugar comes from Canada, with most of it produced in Quebec. Some other countries produce it on a small scale like Japan and South Korea. South Korea is notable because the sap is consumed as a beverage without first being processed into syrup. 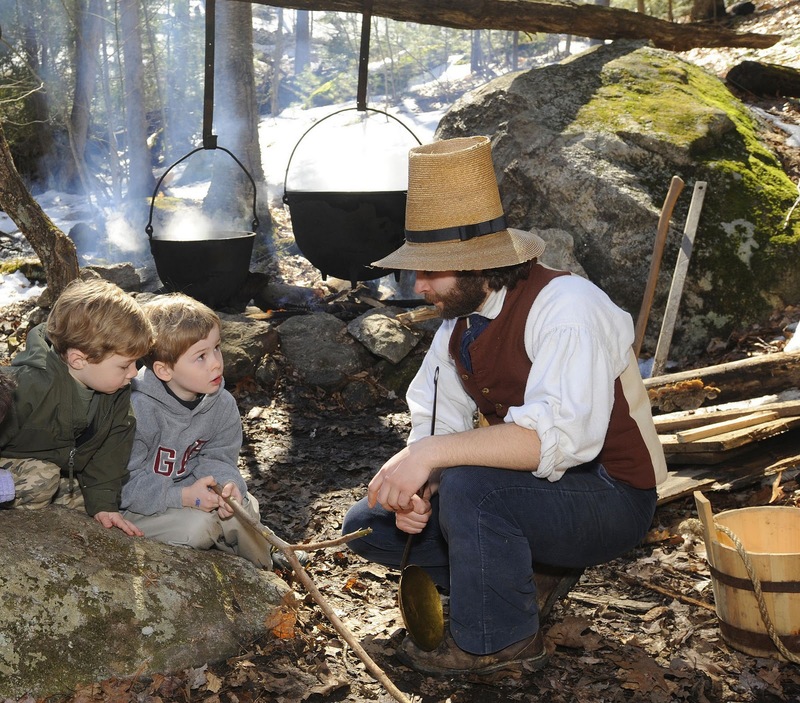 Old Sturbridge Village celebrates life in early New England from 1790 – 1840. Located just off the Massachusetts Turnpike and Routes I-84 and 20 in Sturbridge, Mass., OSV is open year-round, but hours vary seasonally. Winter hours are Wed. - Sun. 9:30 a.m. – 4:00 p.m. (the Village is open on all Monday holidays); Beginning April 2, the Village will be open seven days a week. Admission is: $20 for adults; $18 for seniors; $7 for children ages 3-17; children under 3 are admitted free. Each admission includes free parking and a free second-day visit within 10 days. Woo Card subscribers get 25% of adult daytime admission; college Woo cardholders receive 50% off adult daytime admission. For details, visit www.osv.org or call 800-SEE-1830. Photos and text submitted by OSV.